Northwest China experienced several marked transitions during the Bronze Age (~2000-1000 BCE), including climate change, the spread of mobile pastoralism, the rise of new technologies, and increasing interregional interaction. Ancient human skeletons bear the embodied traces of these transitions, and of the accompanying changes to human health and diet. This evidence, when incorporated into a multidisciplinary archaeological analysis, points to a patchwork of successful adaptive strategies leading to social-ecological resilience in the region. Elizabeth Berger is currently a Postdoctoral Fellow at the Lieberthal-Rogel Center for Chinese Studies at the University of Michigan. Her ongoing work in bioarchaeology focuses on ancient adaptation to climate change, ancient human health, and subsistence strategies in northwest China. 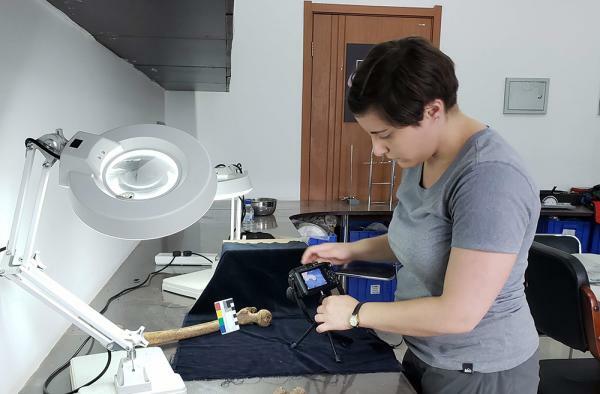 She has also worked on archaeological human remains from central China, investigating Warring States period migration and Ming dynasty foot binding. She earned her doctorate in Anthropology from the University of North Carolina in 2017.